This post is, obviously, about offerings. I’m using kind of a question/answer type format, because I thought it would be easier to write about that way. Do you give offerings? Of what type? How often? Is it “Traditional” or based on UPG? To whom do you offer? Do any of them get jealous or upset if you give to one and not to others? The giving of offerings is an extremely important factor in Roman reconstructionism: in fact, the phrase do ut des, which has been in the minds of scholars and cultores deorum alike for years and years is a good sum of Roman reconstructionism. What it means is “I give so that you might give.” Essentially, the religio Romana is a religion of reciprocity between gods and humans. In keeping with the “reconstructionist” portion of the religio, I try and offer things that would have been available and offered in ancient times. Note the word try: some things I cannot or do not offer (such as live bulls for slaughter and the offering of incense – but I’ll get into that later), and there are some things that I offer as UPG that some of the gods seem to like but were not available back then (chocolate, for example). As far as how often I give offerings, well…ideally every morning and/or night I’ll pour out a libation, though this doesn’t always happen. On festival days I’ll give an offering to the deity(s) who are to be honored, and if I ask for help with something I’ll give offerings as well – do ut des, after all! I offer to any and all of the gods of the Roman pantheon. Though it must be said that some are easier to offer to than others, I have never had an issue with deities becoming jealous or upset if they do not receive an offering that another had. If you give offerings of say food or drink, – do you leave the food there for a couple of hours or a couple of days? Do you ever consume the offerings yourself? It depends on the offering and how much time I have to clean up. Generally this is anywhere from a quarter hour to several hours for perishable offerings, but it might be a day or two for trinkets and other things (like seashells or coins). If it’s food or drink, I’ll take a bite or a sip so I can share the offering. Have you ever had an offering rejected? Yes. This hasn’t happened often, but I have had offerings rejected. When the gods don’t approve, they will let you know. In the religio, this means performing a piaculum, or a sort of extra offering for atonement. I should make a glossary of Latin terms, shouldn’t I? There’s an idea! What is your mentality about offerings? Are they given because they must, because it is tradition, out of love, or to bargain for something…help in a situation, love, money, etc? Do you ever attempt to “trade” offerings for services from your deities? Do they ever ask for payment for services? This…is a good question. 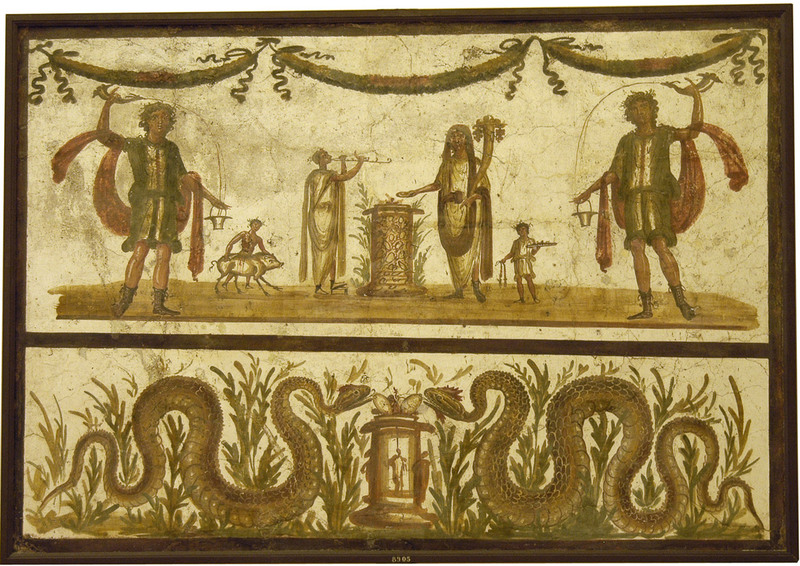 Offerings, in my opinion, are given for several reasons: tradition (the mos maiorum, or way of the ancestors, was a huge part of Roman religion, and is essentially tradition), for the purpose of honoring, for fulfilling vows, or to bargain (do ut des again!). While the Roman deities are believed to be benevolent, that doesn’t necessarily mean that they will do things for free, and I don’t think it’s fair to expect them to do so. How do you feel about animal sacrifices? I don’t live on a farm, I don’t raise my own livestock, and I’ve never done (or even been to) a sacrifice, but I think that, so long as the animal is treated humanely, it’s ok.
Is there a difference between a sacrifice and an offering? If so, have you ever given a sacrifice? What kind? Would you consider going without specific luxuries or necessities (as many do for Lent) to be a “sacrifice”? At the base level, a sacrifice and an offering are the same thing. A sacrifice is making something sacer, or sacred, to the gods. It does not necessarily have to be an animal sacrifice, but this is what I think of when I hear the word sacrifice: I usually use the word offering instead. To ancient peoples, oaths were very important things and were taken with the utmost seriousness. In keeping with the theme of this blog, however, I’ll be centering on the Roman practices of oath-taking. An oath was a statement or promise strengthened by the invocation of a god as a witness and often with the addition of a curse in case of perjury. A defendant in a lawsuit, for example, might swear by a god that his testimony was truthful and might specify the punishment for perjury. If the oath was false, the god, by effecting the provisions of the curse, would punish the individual, not for lying in court but for committing perjury. Throughout antiquity oaths were required of signatories to treaties, of parties to legal disputes, commercial and private contracts, conspiracies, and marriages, of governmental officials, judges, and jurors, and, particularly by the Romans, of soldiers (sacramentum), and, under the empire, of citizens to affirm their allegiance to the emperor. Typically, the Romans called upon “Iuppiter, Dius Fidius and all the gods”. Dius Fidius is a god associated with Iuppiter, but is clearly a separate deity. His full name is Semo Sancus Dius Fidius, or Sancus or Dius Fidius for short. His name comes either from the Latin fides, or trust (who is also a goddess), or from filius, or son – as Dius Fidius is mythically the son of Iuppiter. Apparently, his temple had no roof so that people could swear oaths directly under the sky and thus the view of the god. Treaties, one of the most (if not the most) important oaths that could be sworn were sworn by Iuppiter Lapis. This aspect of Iuppiter, the Stone, was located in the temple of Iuppiter Optimus Maximus on the Capitoline Hill. Like its name may suggest, this was a stone representing Iuppiter in his aspect of one who presides over oath-taking. The punishment for oath-breaking was severe: this was often death for the perjurer, and sometimes his family as well. As a side note to oaths and a fun fact: contrary to popular belief, the Romans did not swear oaths in court by grabbing their testicles. The word for witness, testis, lends itself to “testimony” and not “testicles”. Robert Turcan’s The Gods of Ancient Rome: Religion in Everyday Life from Archaic to Imperial Times is a must-read for anyone thinking about the Religio Romana. I started going through the book and typing up relevant/good information that Turcan uses, but…it took several hours, and that was just looking through the first third of the book. It is 165 pages, and each page is chock full of information, so I’ll just put up the chapter titles and sub-chapters that it has. It’s a fairly recent book as well, first published in 1998, and the edition that I read is from 2000. Turcan takes the popular view that the Romans (the patricians, anyway – the plebeians were a different story) did not have religion as we know it today – that their religions (for, he says, the Romans did not have a single religion but many) were not religions of belief but ones that had a practical aspect. They did not believe that the gods particularly cared about people in the way that, say, the Christian God does, but that they were there to form sort of contracts with. This isn’t to say that the gods didn’t like people: the Romans believed that the gods were generally benevolent and good-natured. Overall I enjoyed this book, except for one small thing. Turcan refers to minor deities/spirits of the land as “demons.” Now, I know this word comes from the Greek daimon, but I really wish he had chosen a different word; especially with the connotations that it comes with. As a sort of follow-up to yesterday’s lararium post, I thought I’d take a picture of my own lararium so you all could see it. As you can see, it’s nothing special – I’m no artist, but I put a lot of time into it, and it’s sort of an ongoing project. There are a few statues in the foreground. The first, on the left, is Mercurius: I study languages and travel a good distance every day to school and work, so in those regards He is sort of a patron. To His left is a little owl statue, representing Minerva: another patron, in that She presides over learning and skills. Behind the owl is a neat replica of an ancient Greek vase – I picked it up recently at the Festival of Nations, though I’m not entirely sure who is depicted on it. To the left of the vase is a figurine of Iuno, patron of women. I have a couple of little bowls set out, one for liquid offerings and the other for food. I don’t usually offer trinkets, but when I do I set them on the white cloth of the lararium. Finally, to the far left is an oil burner. Now, it’s really unfortunate that I’m allergic to incense, which was the traditional offering, but I wanted to be able to give some sort of good-smelling offering. I heard about oil burners, and I thought “Great! I can multi-task with this!” I light a candle (which represents Vesta, goddess of hearth and home) at the start of every offering, prayer, or vow, and it heats up the basin on top with the oil. Et voila – instant sweet-smelling, non-allergy inducing scent! The oil seems to go over well as an offering, too, which is great. Now for the art at the back of the lararium. I based the design off of the lararium of the thermopolium, of which I posted a picture in the main lararium post. It’s probably my favorite lararium fresco. Starting off at the left is, again, Mercurius. He is holding the caduceus and a bag filled with money, symbolic of His office. Next to Him is the Lar familiaris – I drew only one, which isn’t exactly traditional for the classical era but something that has personal meaning. He is holding a cornucopia and a patera, the offering dish. In the center, sacrificing at a tripod, is my iuno, which is basically the female equivalent of the genius. Next to her is Vesta. At the far end is Ianus, two-faced god of beginnings, endings, gateways, doors, and bridges. Phew. He holds a staff in His right hand, and a key in His left – traditional symbols. At the bottom, kind of obscured, are two snakes, symbolizing fertility and creativity, and an altar. Annnd…that’s pretty much it! There are a couple parts that didn’t fit into the shot, such as photos of ancestors, but this pretty much is the gist of it. If you have questions about any aspect, feel free to ask away. Well, it’s about time I kicked my arse in gear to write this post! It honestly should have been one of the first topics that I wrote about, as the lararium is a rather important aspect of the Religio Romana. Basically, the lararium is a place for prayers and offerings. It gets its name from the Lar familiaris, the protector deity of one’s home. In very early times, this was the main deity who was invoked in the morning and evening at the household altar. However, by the time that the classical era rolled around, the Lar familiaris doubled: now, houses paid homage to two such deities. In his Gods of Ancient Rome (a fantastic book which I highly recommend), Robert Turcan mentions that they may have been associated with the Penates, rather obscure deities who may have been either the protectors of the pantry or the patron deities of the family. A fresco from a lararium. In any case, the images painted on the lararia (plural of lararium) follow, for the most part, a common theme. Two young figures – the Lares – with rhytons and libation dishes are frozen in dance on either side of a robed figure. This figure is the genius, or tutelary/creative deity of the paterfamilias, the head of the family. He is shown sacrificing at an altar, or holding an offering dish in hand. Oftentimes in a separate scene below this one is a depiction of one or two snakes. Snakes have none of the ill associations that they became known for in Christianity: instead, they are seen as the guardians of the home and land and are symbolic of the procreativity of the family. They are, in this regard, associated with the genius. Other deities can appear as well. 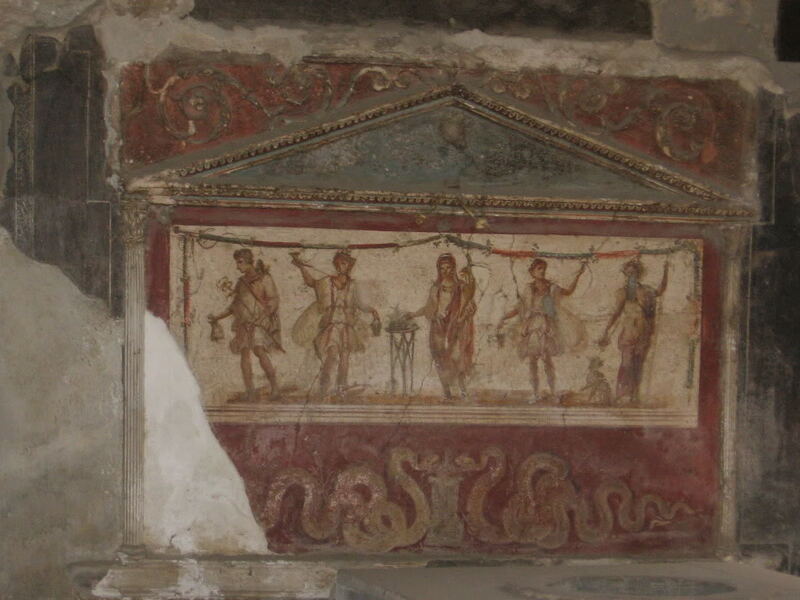 In a famous thermopolium in Pompeii, the gods Mercurius and Bacchus are also present at either end of the scene. The aforementioned lararium. Mercurius is on the far left, Bacchus on the far right. Several tools and statues were also common. There is no evidence for statues of the Lares in the Republic, as they were seen as ancestral spirits, but during the Empire this changed. The statues would be crowned with flowers on the days of the month honoring the Lares, and would also be brought to the table to overlook meals. Salt was seen as sacred and often offered, so the lararia would more than likely have a little box for the salt. Other tools included an incense burner, a candle, and a dish or two called a patera for wine or food. I should probably take a picture of my lararium and post it, hahaha.